(L-R) G. Holtmeier, T. Kehler, N. Leclercq, P. Van Deven and A. Gerini. Philippe van Deven, the General Manager of GNVERT (ENGIE subsidiary in charge of the distribution of alternative fuels) is NGVA Europe’s new President. Previously a Senior Vice-President of NGVA Europe, he takes over from Dr. Gerhard Holtmeier. Also appointed are a new Senior VP and Board Secretary. GNVERT provides a wide range of solutions including the design, building, financing, operation and maintenance of refueling stations as well as the distribution and sale of Compressed Natural Gas, Biomethane, LNG, LBG, Hydrogen and other green or renewable transportation fuels. Before joining GNVERT in September 2013, Philippe held successive positions in Belgium and in Canada for ENGIE in the sector of Energy Services. Further to the appointment of Mr Van Deven, Dr Timm Kehler, Chairman of the German Natural Gas advocacy Zukunft ERDGAS e. V. has been elected as the new Senior Vice-President of NGVA Europe and Mrs Nadège Leclercq, Director of Market Development, EMEA at Westport Fuel Systems, as the Secretary of the Board of Directors. NGVA Europe welcomes them and wishes them success in their new positions. NGV Global adds its voice of congratulations to the new team and looks forward to building on the continued success and collaboration between our associations. NGVA Europe is an affiliated member of NGV Global. 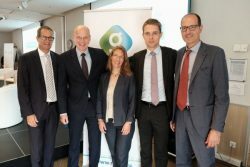 NGVA Europe also extended its sincere thanks to Dr. Gerhard Holtmeier, former President, and Mr Hans Wach, former Secretary of the Board of Directors, for their years of commitment and energy into developing Europe’s premier natural and renewable gas association into what it is today!